“Bump in the Night’s” Chuck Jarman is a man with issues…but that’s just how we like it! It’s our favorite month once again…the cooler weather, scary movies, and Halloween. With the coming of October (or actually late August, early September now) comes stores filled with Halloween masks and props. Of course, most of these leave A LOT to be desired but there are some that you can still buy, usually from smaller mask companies, that never disappoint. 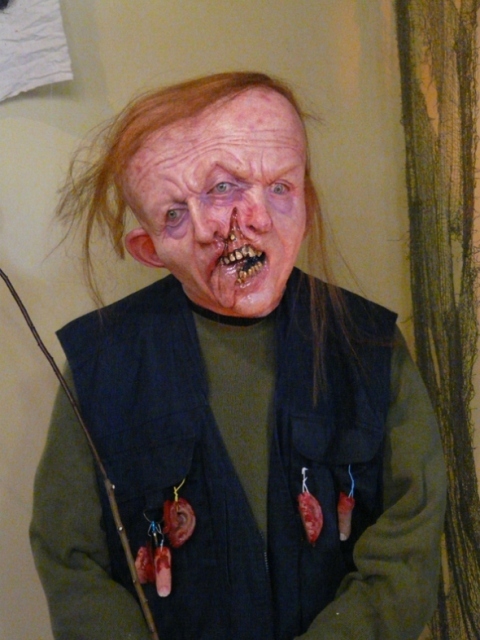 Of course, I am talking once again about Chuck Jarman, owner of BUMP IN THE NIGHT FX. 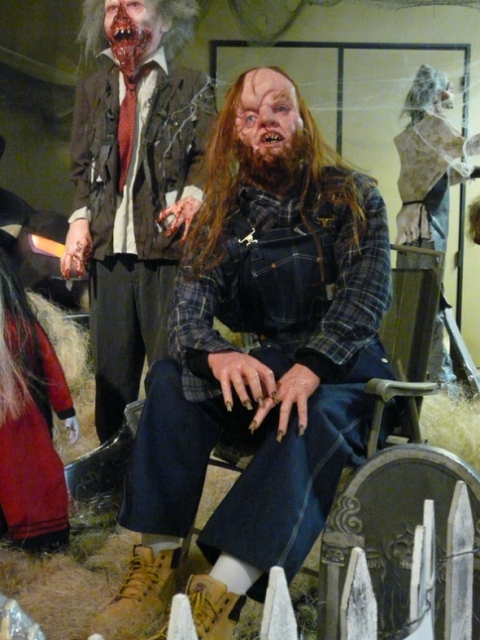 Chuck is no stranger to Terror From Beyond The Daves as he was featured a year ago HERE! Unfortunately, most mask stores do not sell Chuck’s amazing masks. Stores like SPIRIT and HALLOWEENTOWN opt to sell mass-produced masks, many of which can now be found in places like Wal-Mart or Target. There is one exception though…HALLOWEEN EXPRESS! Unfortunately for me, there are no HALLOWEEN EXPRESS stores in New England but thankfully I can still buy Chuck’s great pieces through places like Morris Costumes (and his limited edition props can be purchased on his eBay store HERE). Chuck has always been a fan of Halloween Express and because they have always been supportive of him, he went in there this year at their Walnut Creek, CA location (complete address: 1330 S. California Blvd., Walnut Creek, CA 94596). 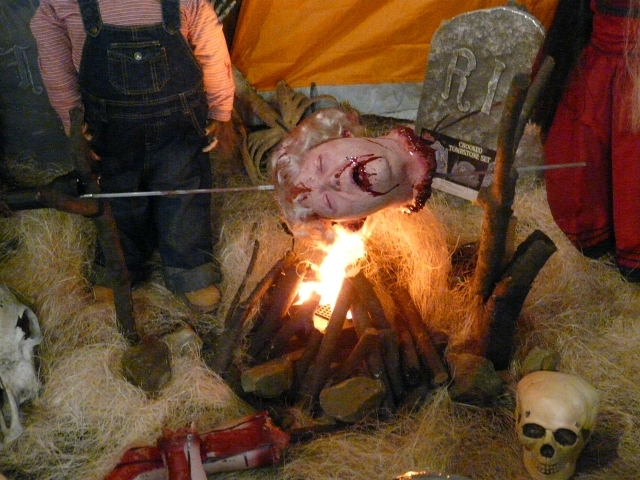 Using his limited edition full-size props he created a display that store visitors will not soon forget! One kid with his Dad was buying some stuff and after seeing the display grabbed his Dad’s hand and said he wanted to get out of there before something bad happened. An older lady in the dressing rooms saw it and went on this whole long story about how she was offended because her son had deformities that look like the “ginger hillbilly”…she had never seen Friday the 13th of course and had no idea it was anything but making fun of deformed people. 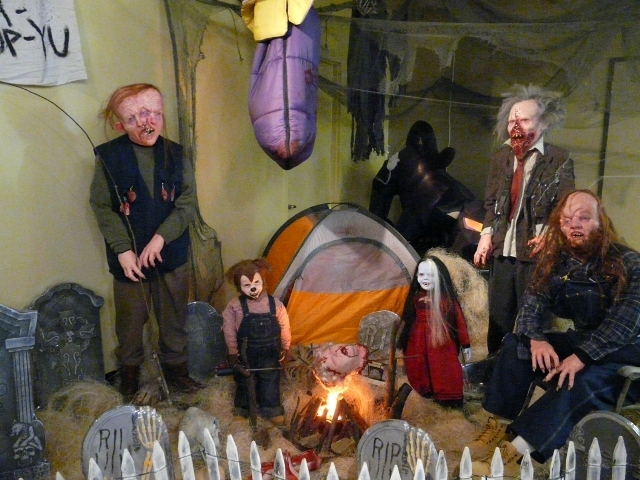 If you are in the Walnut Creek area, make sure you check out Chuck Jarman’s awesome display at HALLOWEEN EXPRESS! This entry was posted in Masks, Models, & Props! and tagged Bump In The Night, Chuck Jarman, Halloween Express, Halloween mask, Halloween prop, Halloweentown, Spirit. Bookmark the permalink. ← Insane for Svengoolie at the Amhurst Asylum!